A question we are often asked is, “How long will my existing roof last?” Many times the question is followed with the statement that another roofer claimed the roof needed immediate replacement. The answer to how long a roof will continue to perform is not so simple. Imagine a car from the 1990’s that is still running, but any moment could blow the motor while driving. Cars don’t always die like that. They generally have one part fail at a time requiring multiple repairs over time. Sometimes the monthly cost can exceed a new car payment. Roofs generally don’t die all at once either. They start having splits, flashing problems or a variety of other conditions requiring repairs. When an ethical roofer tells you a roof needs to be replaced, he has made the evaluation the cost of repairs in the next few years will exceed the cost of the new roof. Other factors that must be considered are the costs of interior damage (deck, sheet rock, contents, etc) and the cost of goodwill with tenants. The roof may also have so many repair needs that it cannot be properly repaired. Neglect is a major cause of roof replacements. For most roofs, this is not the case. Most roofs can be repaired by addressing maintenance issues early, and in doing so, the life of the roof can be extended greatly. This is the purpose of the Zenith Roof Smart Plan. 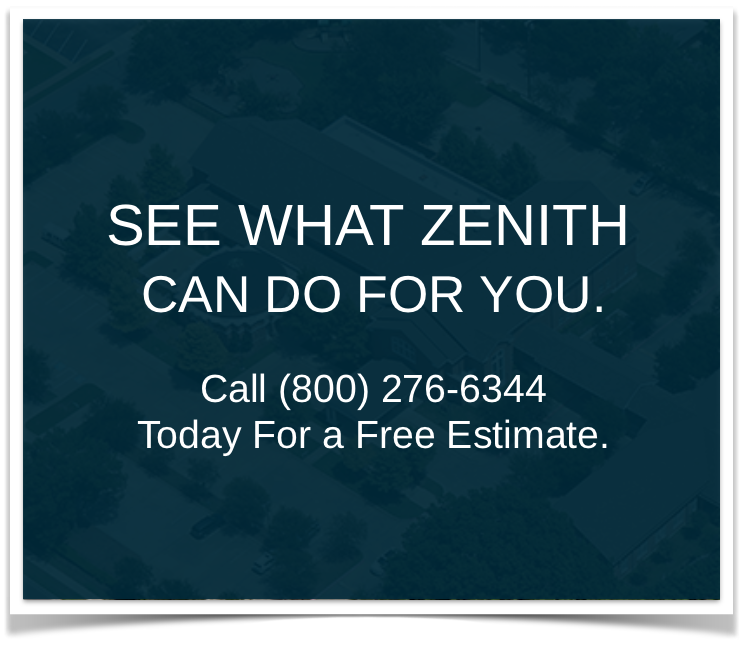 A complete and thorough inspection of the roof is performed by Zenith. This inspection details the condition of the roof surface as well as all penetrations and flashings. This report is provided to the owner. The report includes a list of all repairs and maintenance needs required to extend the life of the roof. Once performed, the roof will be in a condition in which regular maintenance will extend the life of the roof for many years. Once all maintenance is performed, the Zenith Roof Smart Plan warranty will be provided for up to 10 years. The warranty can be structured to meet your needs. Under the Roof Smart Plan, Zenith will inspect the roof once every 6 months plus additional inspections if weather demands. The technician doing the inspection will make any repairs necessary. If larger repairs are needed, a crew will be sent. Zenith will also repair any leaks that occur during the warranty period. At the conclusion of the warranty, Zenith will perform a complete inspection and another report will be provided. A new warranty period will be offered for continued maintenance, if the roof is maintainable. How much does the Zenith Roof Smart Plan cost? All roofs are different and the repair and maintenance needs can vary. The price is based on roof condition, budgetary demands and client needs. The Zenith Roof Smart Plan is significantly less than a complete re-roof. Call today for your free inspection and evaluation. The free inspection tells you everything about your roof and there is no obligation to buy anything. So why wait? Contact Zenith at (800) 276-6344.